Seat of the Synod Mentor (SSM) is a branch of Paradoxical Outcome (PO) lists which seeks to use as much artifact mana as possible in Vintage. The deck attempts to use this mana to chain multiple draw spells until the deck finds and resolves Monastery Mentor with an abundance of non-creature spells left in hand. 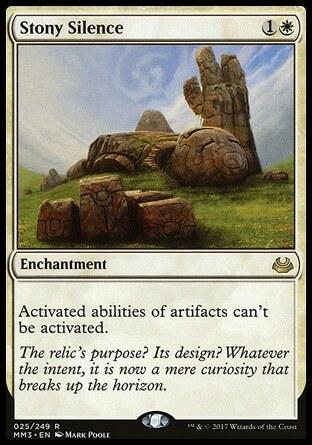 What is the Deal with the Non-Mox Opal Artifacts? For SSM to efficiently enable metalcraft for Mox Opal it requires two other artifacts in play. The probability of hitting at least two other artifacts within the first seven cards is greater than 50% when playing with 14+ Non-Mox Opal artifacts. That is to say, whether or not you draw Mox Opal, you would have a greater than 50% chance of drawing two other artifacts to enable metalcraft. Traditionally SSM folded to Stony Silence coupled with any form of pressure/backup. There are only seven (7) "7?!?!" \7\ non-artifact mana sources in the list. Force of Will (and to a lesser extent chains of vapor/fragmentize/hurkyls recall) are SSM's only answer to the effect. Force of Will as a playset could not be reliably found to counter Null Rods or Stony Silences. For lists running Fragmentize the deck needed to resolve this through Mental Misstep, Spheres, and Wastelands. Force of Will is Expensive. 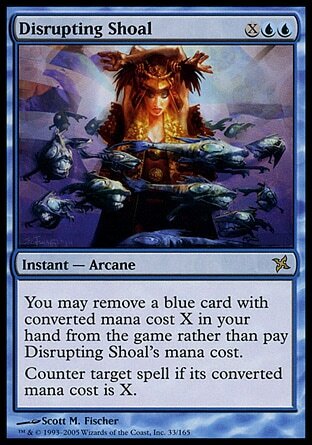 Shoal disrupts from an angle not affected by wasteland or mana denial. Shoal disrupts 2-CMC turn one plays while on the draw. Slower Monastery Mentor lists are the only decks not running powerful 2-drops worth countering. The Paradoxical engine, especially when reinforced by Snapcaster Mage, is a strong draw engine in Vintage. This engine definitely provides enough card advantage to reliably find the artifact mana to hardcast Disrupting Shoal and Force of Will. This engine might even provide enough card advantage to reliably pitch cards to Disrupting Shoal and Force of Will. In particular the numbers of most of the 2-drops can be shifted around as long as there are enough to counter the dreaded Null Rod or Stony Silence turn 1. It should be noted that the deck runs enough 1-drops to use Disrupting Shoal as a functional Mental Misstep (and similarly as a counterspell to Jace, the Mindsculptor using Paradoxical Outcome). Some other niche scenarios where Disrupting Shoal stands out vs. Mental Misstep are countering Black Lotus and other Moxen, as well as combining well with Baral, Chief of Compliance to be hardcast. So Literally All You Did Was Change Mental Misstep to Disrupting Shoal?! SSM lists have inherently fragile mana bases as discussed earlier. This often translates into higher land counts postboard. Cards such as Basic Island and Basic Plains are often found in SSM sideboards even though the deck lacks an efficient way to find them (3x Flooded Strand). I would argue that Cavern of Souls and Karakas should take over this sideboard space as basic lands tend to add nothing to the deck in post sideboard strategies other than mana flood. Similarly most SSM lists have heavy white splashes postboard for cards such as Fragmentize and Disenchant; these cards feel like traps that our primarily blue-based deck can't afford to fall into (3x Flooded Strand, 3x Tundra). Instead I would argue for cards such as Chain of Vapor, Hurkyls Recall, Steel Sabotage, Dismember, Into the Roil, and Echoing Truth as sideboard material if the deck requires permanent interaction. Great primer! This needs Mentor and Deck Tech tags. Tag for later. I've been a bit disappointed recently with my usual basic Island-based PO mentor. I was playing it with the intention of beating shops with its "better" mana base, but it keeps losing anyways, so I figure a more all-in strategy to get an edge in the blue matchups was worth a shot. I'm not a big fan of the Shoal plan on paper, as I already hate 2-for-1ing myself in this deck. I'd be more open to a plan involving Defense Grids for the blue matchup, and then you can play Fragmentize, Chain of Vapor, or Void Snare?! to get rid of the hitman Tony Silence without fear of Misstep getting in the way. Here is another opinion I have: if you are playing Synod, you should probably be playing some number of Thoughtcast. Synod is a greedy card and you should be rewarded for your efforts. It doesn't hurt that Baral discounts Thoughtcast but does not discount Preordain. I don't think that running 0 Preordain is ever correct, but you could run a split perhaps. Edit - I'm not sold on Shoal like the OP is, but at least Thoughtcast recovers the lost CA while Preordain doesn't. But you still often need Preordain for t1 to get things going. I have not been impressed with Thoughtcast/Divination style effects in Mox Opal Lists; the end result is always the same: mana flood. Paradoxical Outcome overcomes mana flood by simply drawing so many cards. A simple draw 2 usually gets the deck nowhere (preordain can dig a card deeper towards PO or Mentor). I like the idea of Thirst for Knowledge as it is on the same power level as preordain, and you can see its use in UB Paradoxical Outcome variants. On the topic of Disrupting Shoal: the card accomplishes what I set out for it to do, which is counter Null Rod and Stony Silence consistently. However, Disrupting Shoal accomplishes little else. Hopefully someone discovers better options than the current "off-color" disruption package of Fragmentize and Disenchant that are (entirely) disabled by Wasteland (and a sphere). Doesn't Annul do 99% of what shoal does, with splash damage to mud and oath? @serracollector Doesn't disrupt T1 plays while on the draw, which seems pretty crucial against lock decks. Congratulations to @neo_altoid for taking Seat of the Synod Mentor to a Top 8 finish in a recent Vintage Challenge.